Kia Motors has lifted the veil off the Mohave Masterpiece Concept at the ongoing Seoul Motor Show. Kia Motors has kick-started its Seoul Motor Show campaign by debuting the Mohave Masterpiece Concept. While the Masterpiece Concept features an all-new design, those aware will immediately tag this as a preview to the future Kia Mohave. The Mohave SUV from Kia is sold in the overseas markets, however, the model saw a brief stint in the US under the 'Borrego' moniker from 2008 to 2010. With this, the next-gen Mohave will join Kia's latest big off-roader, the Telluride, as the brand's other big high-riding model. Coming to the Masterpiece Concept itself, the boxy off-roader features a 'Tiger Nose' grille up front, flanked by four-point LED headlights which highlight the 'ice cube' theme. With its high ground clearance, bulky proportions, skid plates and running boards, the Masterpiece Concept indeed a blend of key ingredients to be a serious off-roader, however, it does come across as a bit too 'blingy', owing to the brushed-metal trim and chrome overdose. At the back, the same design continues with signature lines at both ends. The third brake light incorporated into the high-mounted rear spoiler and multi-element LED taillights on either side of the illuminated 'Mohave' lettering do give the Concept a mean, imposing rear profile. What's interesting here is that the Masterpiece Concept can't be seen wearing any Kia badges. Instead, it carries a bespoke Mohave badge. Further, the blacked-out windows also hint at the fact that Kia is still working on the Masterpiece's interior. 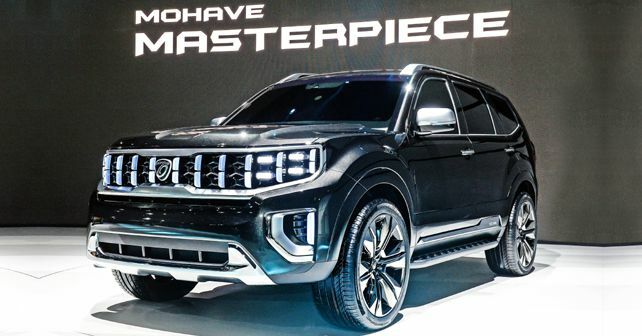 While not much has been revealed in terms of specifications, what we do know is that the next-gen Mohave will feature All-Wheel-Drive (AWD) and the quad exhaust tips hint at a powerful motor under the hood. Kia Motors also took the opportunity to introduce the SP Signature Concept, which is a follow up to the SP Concept shown by the Korean carmaker at the 2018 Auto Expo in India. While there isn't much that's changed on the Signature Concept, reports suggest that it gives a clearer image of its upcoming production version. The new compact SUV will make its global debut in the latter half of 2019, and in India, it will make its debut under the 'SP2i' moniker.